Pastor Jonah Borden, according to the author, "is not your typical Lutheran pastor, and he takes pains to make sure everyone knows it. He's a tough-guy, thinks-he's-funny, rock-music-playing, gourmet-cooking, painfully-moderate-drinking, hard-boiled man of the cloth. He is even available for a bit of romance, under the right circumstances." Aged 32, he is not only the pastor of Harbour Lutheran Church in Grand Lake, Minnesota, but the official chaplain of the local police. He had married straight out of college but after four years (or five  depending on whether you read page 32 or 79!) his wife had been murdered during a burglary and he had killed the murderer in self defence. This had been five years before we first meet him. His father had been a cop and he explains that, "Even my mother wanted me to be cop, not a pastor," and he freely admits, "I'm probably pretty weird for a pastor .... But don't get me wrong. I'm serious about my faith and about being a pastor, I'm just not serious about conforming to everyone else's expectations of how pastors are." He is truly described as "a refreshing antidote to the stereotype of a pastor." He likes to escape from his problems by going fishing. It is he who tells the story throughout. 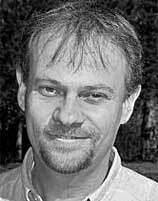 Rev Theodore (Tom) Hilpert (1969 - ) grew up in Papua New Guinea, where his parents were working as missionaries. He was subsequently awarded his BSc at Oregon State University in Corvallis, Oregon and a Master of Divinity from the American Lutheran Theological Seminary in Minneapolis, Minnesota, and was ordained in 1997. He lives now with his wife and four children in the woods of Tennessee near Nashville on a little farm complete with goats, pigs and chickens. Like his creation Jonah Borden (see below) he is a small town pastor who enjoys fishing, cooking and the outdoors. 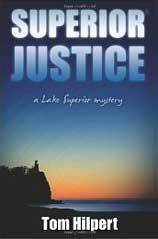 He has published numerous articles and several books including the non-fiction title Surviving Seminary as well as the Lake Superior mysteries, reviewed below. He is currently the founding senior pastor of New Joy Fellowship in Lebanon, TN, and describes himself as a "dynamic Bible teacher", but says, "I try not to preach through my writing." Superior Justice tells how Doug Norstad, a member of Pastor Jonah Borden's church, is arrested for a vigilante killing. Norstad shares his true alibi with Jonah, under the privileged status of religious confession. Knowing now that the man is innocent, Jonah must prove it somehow, without divulging his secret. Along the way he uncovers a twisted series of murders and cover ups. Before it is all over, Jonah himself has been bribed, beaten, shot, and arrested for murder. Even worse, he falls in love. You can't complain that nothing happens. It gets off to a rather uncertain start: "Daniel Spooner died on Tuesday in early May, just as the lunch hour was ending in Grand Lake. He died in custody, just in front of the courthouse. He died because his heart was broken into three pieces by a single .30  caliber bullet. Later, some called it a crime. Many more called it justice. For me, once Spooner's killer told me his real alibi, it became a royal pain in the neck." At first I found the flippancy quite off-putting but, as the story progresses, you get more used to it - and even start to enjoy it, for Pastor Jonah is nothing if not an intriguing character and we soon discover why local police chief Dan Jenson wants his help. You even begin to sympathise with him when the latest member of the sheriff's department, Rex Burton, tells him, "I don't like religious people. I think they are interfering, ignorant idiots. Religion is for pansies, and I don't need it, and I'm not interested in making nice with a priest." But Jonah, of course, is perfectly capable of standing up for himself, so when Burton tells him "You're full of crap," he replies "Like looking in the mirror, isn't it?" Jonah goes on to meet "a gorgeous woman, maybe twenty-five or twenty-six. She caught my glance and smiled directly at me. The effect was stunning. I smiled back at her. I felt weak-kneed, and it was a good thing I was sitting down." This was Leyla who turns out to be a reporter for a local TV station who has very mixed motives. "Are you having lustful thoughts?" she asked. "Not yet," I said. "Maybe later." It makes a thoroughly entertaining, if not always a very likely, story. And there's always plenty of action to keep things going. Jonah can't devote too much of his time to detective work as he has too many other things to do: "Sunday Morning I preached a brilliant sermon, as always. Only half a dozen or so people fell asleep." His sense of humor cannot but win you over: "Actually, I wasn't really sure they were asleep. It's hard to tell sometimes, especially with Scandinavian Lutherans. A Scandinavian Lutheran who is asleep looks pretty much the same as one who is dancing. Not that they ever dance, of course. In any case, a few people did in fact seem interested, and, as usual, some even commented afterwards. Some of the comments were even positive." You can't help feeling that much of this was what the author, a real-life pastor, would have liked the freedom to have said for himself, as when he tells us, "There was a digital text I was often tempted to preach on: Judas went out and hanged himself. It was a great text. That was the kind of Bible verse that would wake you up. That was the kind of verse that would make people sit up, Scandinavian or not, and say, what will he say about that? And the thing is I did have something to say about it." But then, he's got something to say about most things. Below his hard-boiled exterior (that owes much, the author admits, to his reading of Raymond Chandler and Robert B Parker), his religious faith seems real enough: "I spend 20 to 30 hours a week studying and preparing my sermon. I try to keep from being a hypocrite, so I also try to nurture my faith  you know, with prayer and stuff like that. I do a fair amount of counselling and quite a bit of planning." As well as attending boring meetings, "When I can, I attend ballgames and other community events. I visit sick people and people in jail. I do some writing and sit on a community board or two. But I'm not a workaholic. I'm full-time, but I always have enough room in my calendar to date a beautiful reporter." "Well," Leyla tells him. "I suppose that's adequate. I always thought priests and pastors just spent all their time, you know, being holy or something." "I have got the 'or something' part down. Still haven't mastered the holy thing, though." So Jonah is more than just a caricature. After visiting the accused murderer, Doug Norstad, in prison he stops to ask a prison guard, "Is there anyone here who hasn't had a visitor in a while?" and explains to us, "Might as well keep doing my job while I was in the building." And so he meets and chats about fishing with Bronco, a black prisoner, an encounter which is to prove extremely useful when he ends up in prison himself. As Jonah watches him leave, he is pleased to see that Bronco "seemed to have more spring in his step" and comments, "It seems there's always a payoff for doing something nice for no particular reason." As a police chaplain himself, the author is well aware that "Jail-time removed the menace of the criminal from the street, but it never corrected anybody" and his description of violent life in the cells is both moving and sadly convincing. As is his portrayal of a corrupt policeman known as Hollywood. But who is Hollywood? In trying to solve this problem, Jonah does not prove to be quite as good a detective as he had hoped. Some of the more melodramatic parts of the plot may seem less realistic, as when Jonah single-handedly fights off the attack of three ruffians, or later on plays a leading part in rescuing a hostage. But he is irrepressible, as when he claims: "Surely, fish and women were proof that God exists, and loves man." Superior Storm describes how Pastor Jonah Borden loses the life savings of an elderly widow when customers of the First National Bank of Grand Lake, Minnesota, are robbed, and he not only gets shot but shoots and kills one of the robbers. He feels it is his duty to try to recover the widow's money, for, as he explains with welcome humor, "All I had to do was to take these facts and solve the case, because surely I could do it better than any other professionals who were working on it. After all, they had only devoted careers to this sort of thing, whereas I was a highly trained pastor." But his friends in law-enforcement can't seem to help him, as information about the case mysteriously disappears. In the meantime, he is keen to see more of the beautiful Leyla Bennett who is now managing editor of the local newspaper. In the end he sets up his own marriage counselling boat trip for two couples who have come to him for advice (with Leyla as captain! ), but once they get out on Lake Superior things go terribly wrong. Arch criminals, the FBI, double or treble agents, wild storms, people overboard, frantic pursuits, gunfights, a bomb explosion, you name it, it all happens with a plethora of nautical technical details that threaten to drown the reader as well as the participants. Even Jonah admits that "It sounds crazy, a one-in-a-million situation." For him, "Death held no fear," which is just as well in the circumstances. However, when dealing with situations like these, even the author seems to get out of his depth. He is very much better dealing with the sort of problems that he might have come across in his own pastoral life as when Jonah counsels old Ethel Ostrand who wants to discuss her funeral arrangements with him and, as she distrusts banks, keeps $237,556 dollars in cash under her mattress. A pity he ventured so far from these more familiar situations especially as, by comparison, the first book seemed so full of promise. A good editor might have persuaded him to cut down on some of the unlikely melodrama, the overlong descriptions of sailing techniques, the pages devoted to his favourite recipes and even the occasional repetition, as when he is twice told that he is "a refreshing antidote to the traditional pastor stereotype" - even though he is certainly is. The author has his own website. The Kindle cover is striking although it does not seem to have too much connection with the plot, even if it does suggest the Lake Superior shoreline where all the action takes place.